Expectations are annoying. This is going to be one of those weird reviews where I really liked the film, but no matter how much editing I do, my tone is going to sound disappointed because my expectations were too high. I really liked The Place Beyond the Pines. It was good. It just wasn't as good as I thought it would be. Our story opens with a long take of Luke (Ryan Gosling) preparing for his daily death-defying stunt driving a motorcycle in a spherical cage with two other riders. This foregrounds the film's focus in the visual register, and after constructing this tower of aesthetics it dives directly down into the pool of thematic development, with Luke giving up his career in an effort to be a father for his child. From there the film retains this dual focus through its three-part narrative structure, discussing issues of masculinity and fatherhood alongside carefully constructed imagery of the characters' emotional and ethical conflicts. Through the lives of Luke, Avery (Bradley Cooper), and their respective sons Jason (Dane DeHaan) and AJ (Emory Cohen), the film examines a wide variety of issues surrounding contemporary masculinity. All four men are forced to show strength in the face of adversity or crumble under the guilty weight of their failures. They're given opportunity to courageously stick to their principles or fearfully compromise them. They show pride and humility, they experience failure and success, and through it all they learn the difference between what you leave on the surface for others to see and what you keep inside for yourself. Ryan Gosling: the ultimate symbol of contemporary masculinity. I really liked all the central performers, from reliable Hollywood mainstays like Gosling, Cooper, and Mendes, to the up-and-coming promise of the younger Dane Dehaan. Cianfrance's direction feels oddly pitched at times, as if the actors' words feel unnatural coming out of their mouths, but everyone succeeds in creating memorable characters nonetheless. The soundtrack was also a big highlight for me. It manages to be versatile and cover a wide breadth of emotional ground while remaining consistent with the overall atmosphere of the film. It has an airy, romantic quality to it, but succeeds just as well with darker, serious subject matter. This is exactly the type of movie I should fall in love with. It's thematically driven and has a strong focus on aesthetics. But it also has a couple weaker aspects which left me with the simple warm glow of appreciation rather than the intense hot blaze of pure adoration. A lot of the thematic developments feel a bit forced or inorganic. This had the unfortunate consequence of me laughing at a few serious moments which involved such obvious parallels or coincidences that I had trouble taking them seriously (e.g. there's a serious overabundance of people trying to give money to or take money from Eva Mendes, and the second time Avery ends up in the forest my only reaction was a detached, unsurprised "of course"). 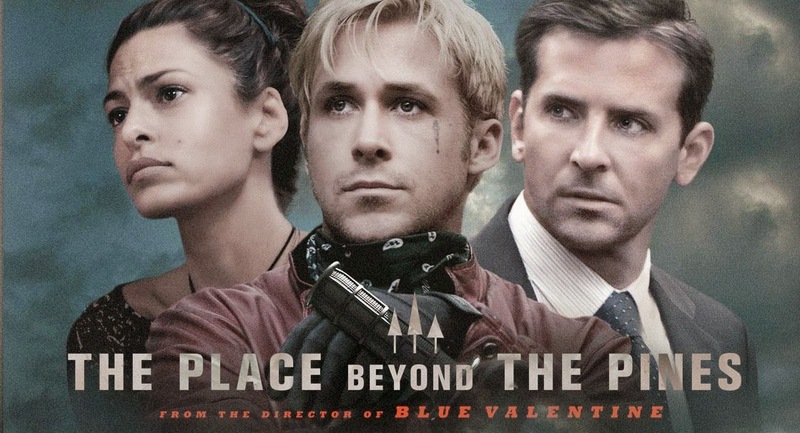 This is the distinction between what makes a good film and what makes a great one, and while The Place Beyond the Pines didn't quite make it into the realm of greatness in my book, it has its heart in the right place and I found its attempts to discuss big questions quite admirable. Subtle "arrogance" is (not) subtle. Opening on a long take the way it does was misleading in my experience, as it set me up to focus on the camerawork with expectations for something on the level of Paul Thomas Anderson or Alfonso Cuarón. But while there were a few subsequent visual flourishes (obstructive framing in the vein of Kurosawa or Wong Kar-Wai, 180-degree rule violations á la Godard or Kubrick), for the most part the camera employs the irritatingly unsteady handheld aesthetic of too many low budget independent productions. I'm not against the use of handheld in some situations, and the opposite option of overproducing every scene is no better, but using handheld should be an artistic decision tailored to the situation rather than a permanent stylistic modus operandi. This might just be my personal preference, but by the end of this rather long film I was left with too few standout visual moments to justify the decision. At the end of the day I can appreciate the scope and ambition of The Place Beyond the Pines, but it's a film which shows you a deep pool and a majestic tower only to give you a cursory exploration of each. I didn't find as much as I went looking for, and by taking for granted the fact that there was anything to see at all, I came away with an odd mixture of pleasure and disappointment.